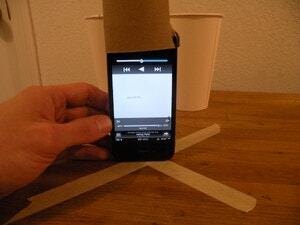 A quick search on Google will bring up countless ways to make DIY speakers (or volume-boosting amps) for a smartphone. From a paper cup to a glass jar, nearly all of these will give you some extra volume, but which ones work best? We decided to test out a few of the most popular tricks. To test the volume, we're using the not-entirely-scientific iPad app Decibel Meter Pro to check sound levels from the speaker on an iPhone 4S. We'll also use the same song for each method, The Beatles' "Helter Skelter", since it starts out nice and loud with the peak around the 12-second mark. Each different amp had its sound directed at the iPad as best as possible. The average decibel level in the room prior to playing music was 51. With that, let's take a look at the results. 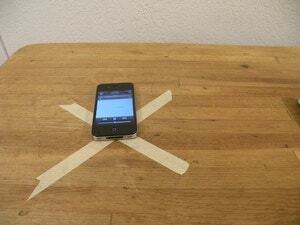 Our first test was just the iPhone sitting with no amp on a tabletop. Decibel Level: 59 Decibel Change: +8 Sound Quality: Poor. Lots of highs and no lows. We've walked you through this method before. 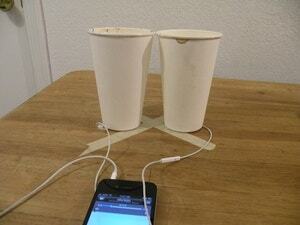 It's essentially shoving a set of earbuds into a paper cup. Decibel Level: 53 Decibel Change: -6 Sound Quality: OK. The volume is lower, but the stereo sound provides a nice effect provided you have a quiet place to listen. 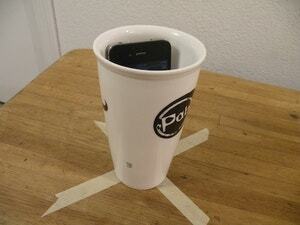 The most common variation on the smartphone DIY amp is to place it in some sort of cup. We tested glass and ceramic, but plastic is known to do well too. Here's how the ceramic cup did. Decibel Level: 60 Decibel Change: +1 Sound Quality: Good. It didn't pick up a lot of volume, but the sound quality increased and made it more clear. We've heard the toilet paper roll doesn't do much good, but we decided to try it our for ourselves. As it turns out, it kind of stinks. Decibel Level: 63 Decibel Change: +4 Sound Quality: Poor. Not matter how we shaped the toilet paper roll we couldn't get the music to sound better than when there wasn't an amp at all. 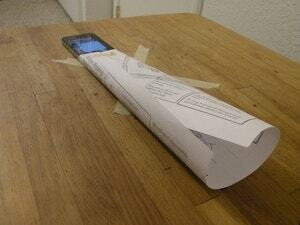 A rolled-up sheet of paper as an amplifier is one of the easiest and most common tricks. 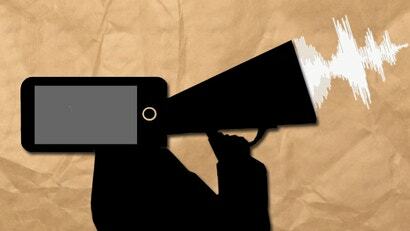 You'll get louder sound from a longer roll, but we used one sheet of letter-size paper. Decibel Level: 64 Decibel Change: +5 Sound Quality: Good. Lows sounded better than no amp and the highs seemed to carry further. 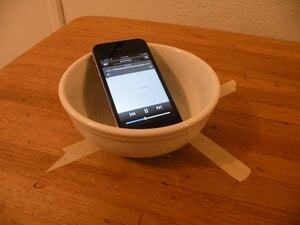 Another one of the old tricks is to stick your smartphone into a ceramic cereal bowl. The shape of a bowl supposedly creates a nice little volume boost. Decibel Level: 64 Decibel Change: +5 Sound Quality: OK. Some rattling kept the lows from sounding good, but the sound carried far. 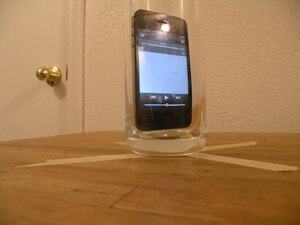 When we covered the smartphone in a glass jar tip before, we talked about it as a way to boost your alarm clock sound. It only makes sense it'd be worth trying out for music too. Decibel Level: 67 Decibel Change: +8 Sound Quality: Poor. It was louder, but the two different glasses we tested it with created an echo effect that was hard to ignore. When I last worked in an office I only had an ancient PC with a barely functional copy of Windows XP installed on it and no music player. This cardboard construction was my solution. I figured I'd introduce it into the test to see how it faired. 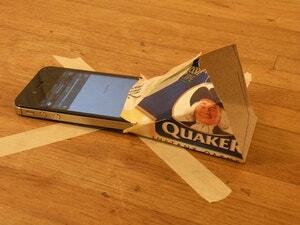 It's an oatmeal box cut to fit around the iPhone and project the sound. Decibel Level: 67 Decibel Change: +8 Sound Quality: Good. The sound quality doesn't change much, but it carries well across the room and kept a good mix of the highs and lows. 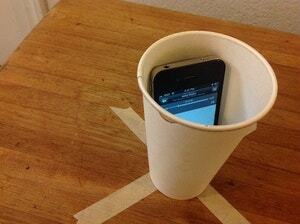 37 Signals programmer Sam Stephenson posted the coffee cup as iPhone amp a while back. It might not seem like paper would boost volume better than the other methods, but it ended up being the loudest in our tests and sounds good. Decibel Level: 72 Decibel Change: +13 Sound Quality: Good. The paper cup was not only the loudest it also sounded the best regardless of where we were in the room. Quality was on par with non-powered speakers I've heard. As we noted at the beginning, this isn't exactly the most scientific test in the world, and your mileage may vary. For our conditions, the paper cup was not just the loudest, but also the best sounding. None of these methods make listening to music great, but they do offer a boost so you can hear better. We've seen quite a few of these tricks over the years, so if we missed your favourite method or you know of a better shape we didn't try, sound off in the comments. If you want to test and post your own results, please do.